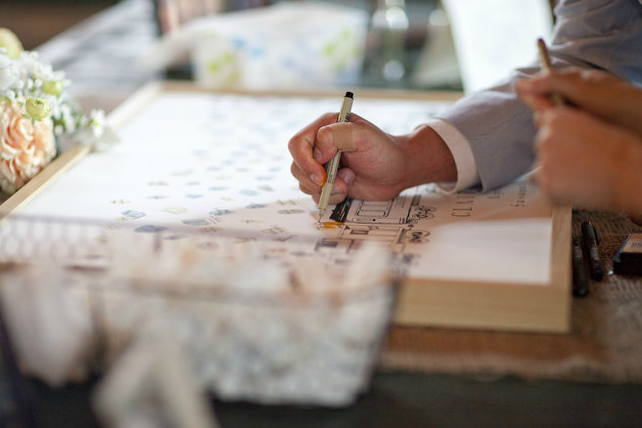 Back in April we had the pleasure of attending, and working on, the lovely wedding of Claire & Eddie in Savannah, GA. It was a peachy keen affair and so unique to the couple. Check out their wedding, featured today on Grey Likes Weddings. Their ceremony was in a picture-perfect, charming country chapel surrounded by spanish moss, while the reception was in a bona-fide train museum (a perfect setting given the groom is an engineer). 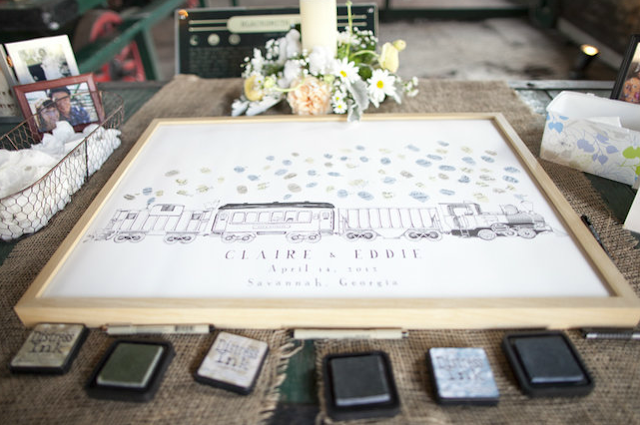 For this special couple we developed a train themed guestbook to match the setting. This carefully crafted drawing is complete with a steam engine, hopper, passenger car (with their pets in the windows), and caboose. 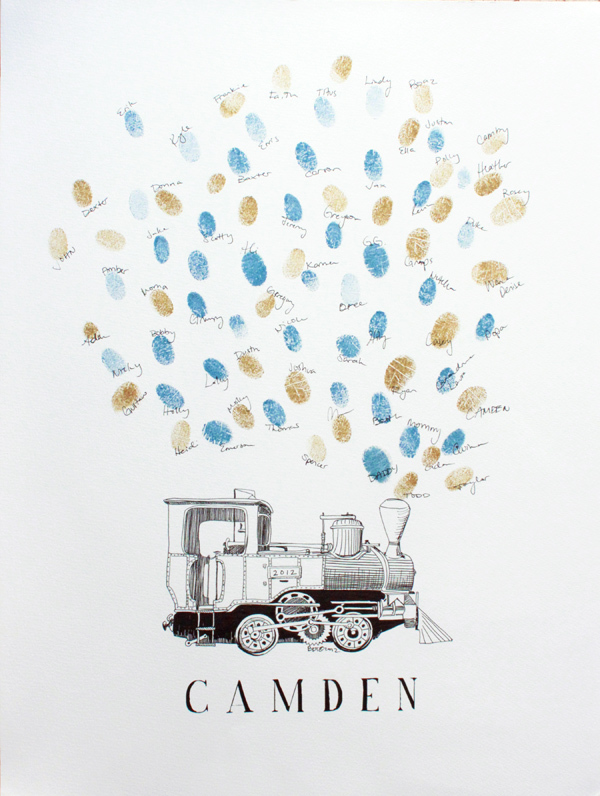 Each of the guests left their fingerprints (or thumbprints) above in smoky shades of grey and blue to look like the puffs of steam coming from the engine. Now it hangs proudly in their home as a memory of that special day. We were so happy with how it turned out that weve decided to offer the unique designs for a variety of your most special, train loving events. My nephew, who turns 3 this month, is obsessed with thomas the train (and anything train related) and will have a smaller version of the personalized fingerprint steam engine at his super fun birthday party. This product is the perfect special touch to a birthday party for your favorite train loving toddler. We can personalize markings on the side of the train to commemorate the special celebration. The train shown below has the year but you could also add something like "____ turns 3" or "Conductor ______" in addition to whatever text you like below. Get on the train and get your today! 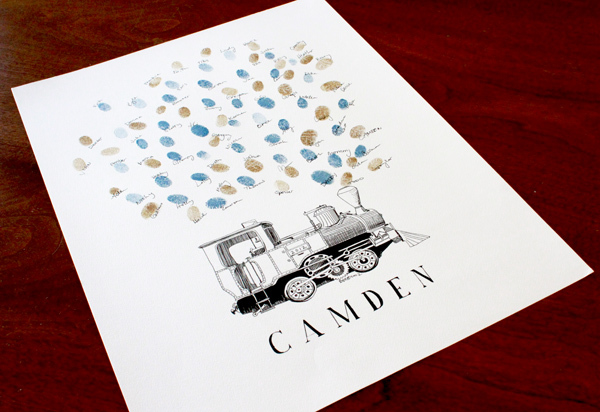 Request the steam engine only design for smaller parties (15-30 guests on a 11x14" size x-small or 30-70 guests on a 15x20" size small paper) or the full train with three cars for larger parties (up to 200 guests). Available at our etsy shop today! For more pics of Claire and Eddie's beautiful day visit Jade + Matthew Take Pictures.